Today, The U.S. 30% Club and theBoardlist announced a strategic partnership to improve gender diversity in the boardroom, expanding the network of board-ready women and promoting participants in The U.S. 30% Club’s Future Female Directors program. Every Future Female Director is sponsored directly by their CEO or Chairman as a highly-qualified, board-ready candidate and receives the support of The Club’s executive search members throughout the nomination process.. Since the program’s launch in 2016, 9 participants have been appointed to serve on their first public company board. 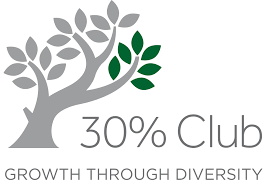 The U.S. 30% Club launched in 2014 with a goal of achieving 30% female directors on S&P 100 boards by 2020. Its members, including founding chairman Peter T. Grauer and founding members Warren Buffett, Sheryl Sandberg and Larry Fink, have also made commitments to increase gender diversity throughout their entire organizations. Through this dynamic pairing, The U.S. 30% Club and theBoardlist will expand the network of senior leaders and board directors working to promote and discover outstanding board-ready women in an effort to achieve more balanced corporate governance. theBoardlist is a curated talent marketplace that connects highly qualified women leaders with opportunities to serve on private and public company boards. Starting with the technology industry and now expanded across many verticals, theBoardlist offers public and private companies a platform to accelerate opportunities for women to achieve at the highest levels. Follow theBoardlist on Twitter @theBoardlist.